Sun Valley, ID (August 15, 2013) — Smith Optics, the market leader in snow goggles, helmets and the pioneer of interchangeable sunglass lens technology announced today its expansion into the bicycle helmet market. The brand will unveil its debut collection of bicycle helmets at the upcoming Interbike 2013 tradeshow (Booth# 15024), September 18-20th with testing samples available at the OutDoor Demo (Booth #D3270) at Bootleg Canyon the preceding two days of the show. “For years our customers have asked us to create bicycle helmets and we’ve been reluctant to do so because of the barriers to entry in the category. Ninety percent of the bicycle helmet market in the United States is dominated by four brands and all of the brands share a common material EPS (Expanded Polystyrene) as the foundation of the helmet design for impact absorption. Through our dedication to leading the winter helmet market, we discovered Koroyd®, a patented tubular core material. Not only is Koroyd a better impact absorption solution than EPS, but also an impact absorption material that provides ventilation, ideal for the bike market. What our product development team has done for bike helmets will disrupt the helmet industry in the same way that EPS replaced leather and foam on bike helmets from the 70’s. If you think about it, nothing remarkable has happened in bike helmets since EPS microshell helmets were created. That is all about to change with the Smith FOREFRONT” said Blair Clark Sr. VP of Sales & Marketing. Forefront all-mountain bike helmet from smith optics on Vimeo. 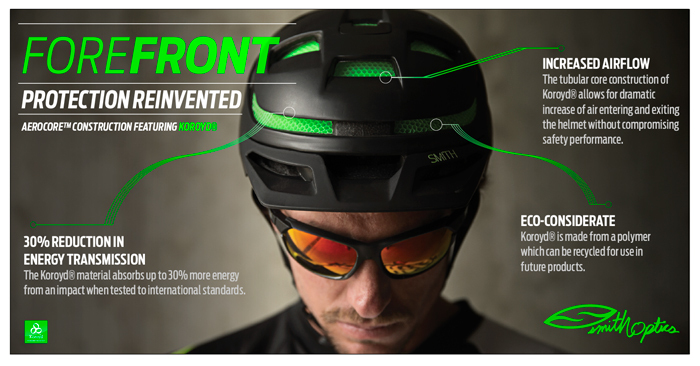 The all-new FOREFRONT (MSRP $220) defines Smith’s innovation platform and serves as the ‘go to’ helmet for all-mountain riders. Created to provide all-mountain protection with road-race weight, the Aerocore™ construction of the FOREFRONT allows riders ventilated protection as never before seen in a bicycle helmet. With up to a 30% improvement over standard EPS impact properties, the patented tubular core structure of the Koroyd® material combines with EPS to create a system of materials designed to surpass current standards at low and high speeds. Aerocore construction allows for ventilated protection, reduced weight, and reduced volume. Weighing in at 285g, the FOREFRONT helmet features Smith’s new VaporFit™ adjustable fit system, integrated camera and light mounting area, and an additional helmet goggle retention strap. Based off of Smith’s proven head form and dedicated investment in unique sets of tooling, three adult helmet sizes are available to accommodate a variety of fits while 10 progressive color options offer a range of style choices, all designed with the ultimate integration of sunglasses and goggles in mind. “As a product-driven brand, it’s our goal to create innovations that improve the user’s experience. Our Aerocore application allows us to reduce volume and weight while increasing ventilation and impact protection. We believe the new FOREFRONT all-mountain helmet showcases exactly what Smith is all about: redefining what riders should expect from their products,” said Eric Carlson, VP of Product and Design. “The FOREFRONT is the lightest, most comfortable helmet I’ve ever worn. 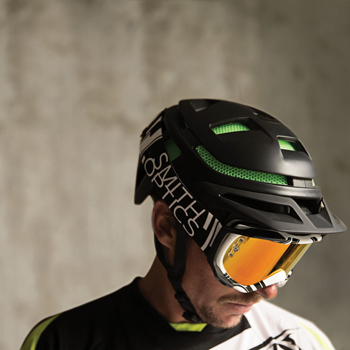 It’s been great to be able to work with Smith on the development of this helmet to assure it meets the needs of all-mountain riders and racers,” commented Lars Sternberg, professional mountain biker. Smith bicycle helmets will be available at North American retailers in Spring 2014. The 2014 Smith bicycle helmet line consists of three unique models; the FOREFRONT $220 MSRP, MAZE $80 MSRP, and HOLT $50 MSRP. Consistent with the rest of Smith’s product lines, the Smith bicycle helmets feature ultimate integration, beautiful design and premium performance solutions, plus a lifetime warranty. Additionally, Smith offers retailers high margins and special Interbike show incentives. For news and updates concerning helmets and additional product launches, be sure to sign up for Smith’s newsletter.